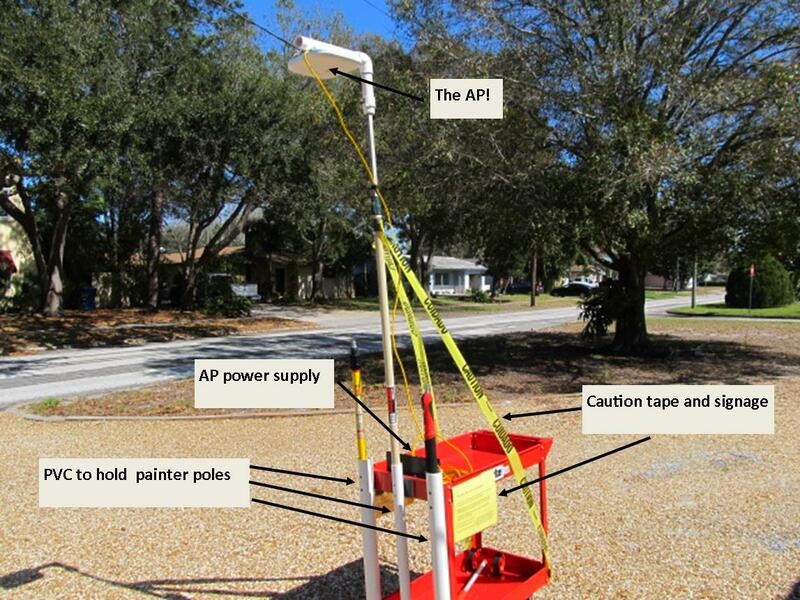 You’re almost finished with an AP-on-a-stick site survey and your battery dies! Or, you have a UPS powering the AP and you cannot find a close electric socket to recharge the UPS. Or you have an AP model that requires PoE+ and your power supply just cannot provide the “juice” it needs for these newer APs! 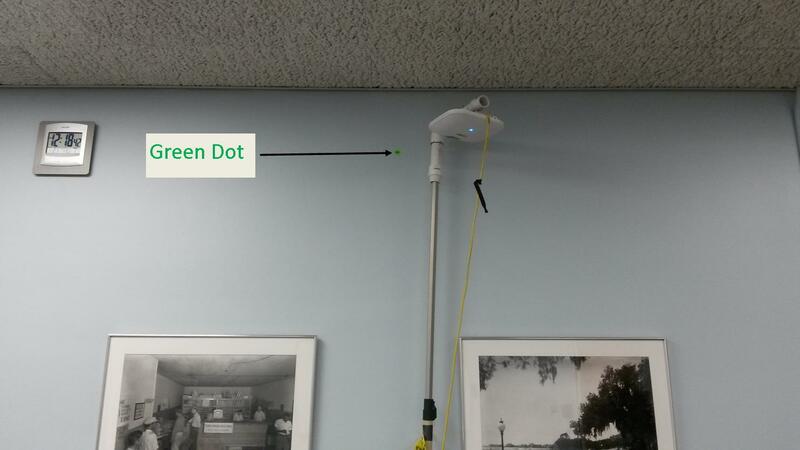 Welcome to the ever-changing world of Wi-Fi site surveys. However, there are new tools out there to help the WLAN professional and one of them is the VenVolt MK1 by Ventev (a.k.a. “orange juice”). It is sleek looking, light weight and the company says it will power an AP for over seven hours. 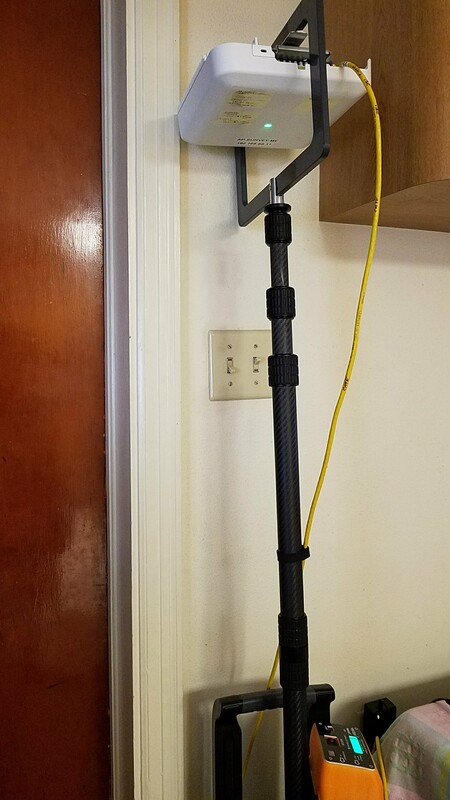 Gcatewifi was asked by Ventev to review this AP site survey power source, so whada ya say we pop the hood on this baby and take it for a test drive? When my VenVolt arrived, of course I dropped everything to open the box and check it out. It comes with a recharging wall wart and although Ventev says to recharge it for at least five hours, I saw it was up to 100% charge in a little over two hours. Still, I let it charge overnight before testing it further. 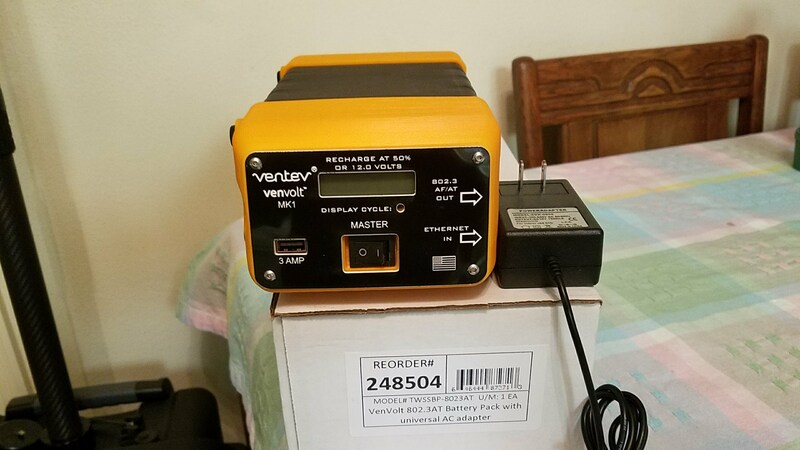 A little more on the details: The VenVolt has a USB 3.0 slot on the front (so you can charge your cell phone while you survey! 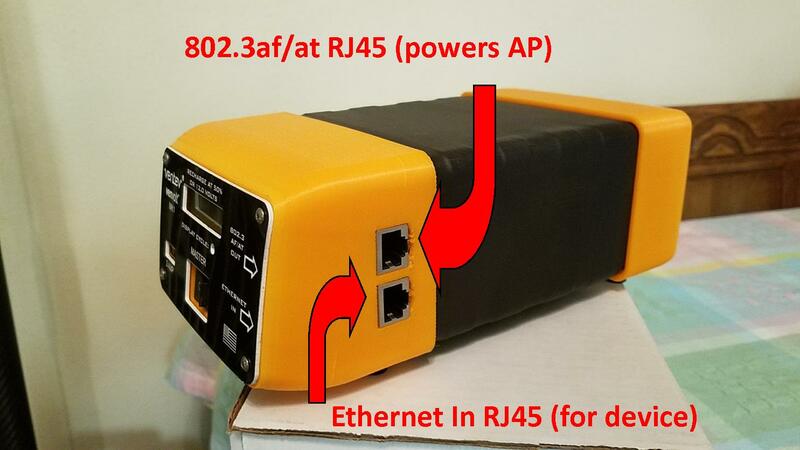 ), an RJ45 802.3af/at RJ45 slot (at = PoE+) to power your AP , and another RJ45 connection if you want to run iPerf with a device attached via Ethernet. Back to the front, there is a small button to use for the Display Cycle switch (use a paperclip) which changes the display screen from battery voltage, to battery percentage, to off. 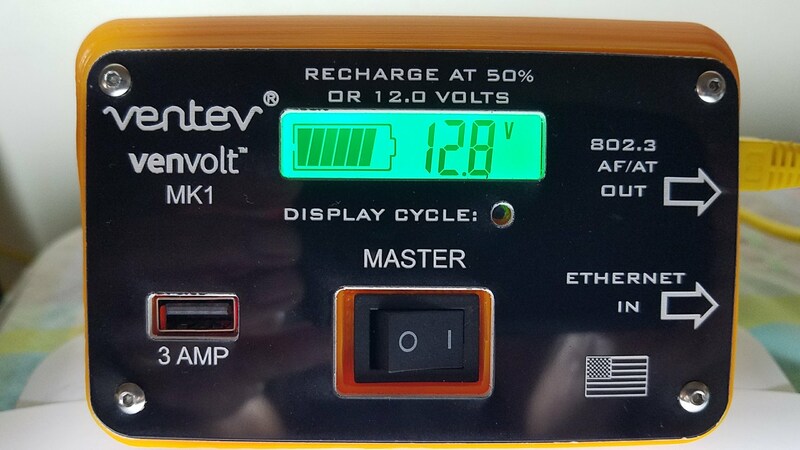 Ventev warns that when battery voltage goes below 12 V, the battery is about to die, so fair warning! When fully charged and still connected to the wall wart charger, the display will say 18.4 V (when you remove the charger, the voltage will drop to about 13.5 V). My testing consisted of setting both APs to full power on both the 2.4 and 5 GHz bands (that’s 23 dBm/200 mW). 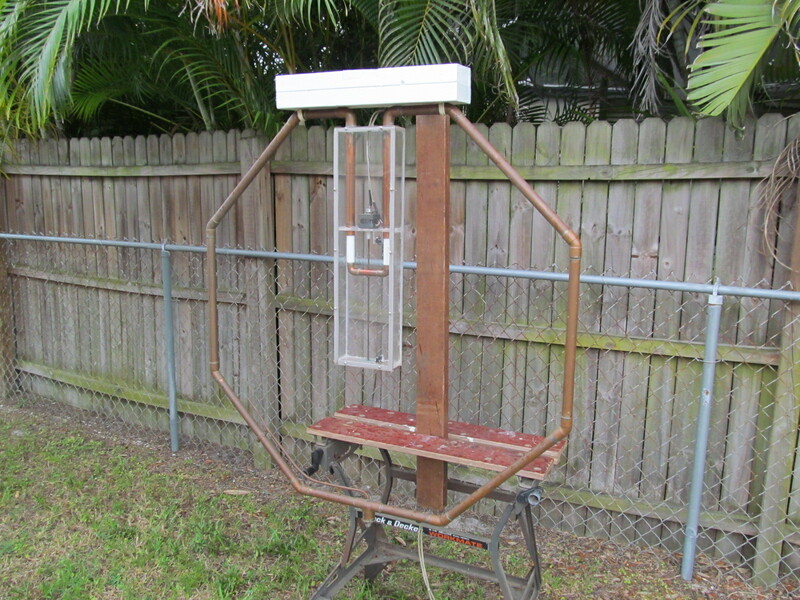 Then I tested again, using some lower survey power levels (17 dBm/50 mW). Looks like the documentation Ventev has published is pretty accurate. The Cisco 3700 does last for over ten hours and the Cisco 3800 for about six and a half hours. I did notice that when the battery hits around 12 V/50%, that you don’t have a lot of time left before the VenVolt goes completely dead (the power lasted about thirty minutes to an hour after it hit the 12 V mark). The VenVolt kept the AP powered until it dropped under 9.8 V. However at this low voltage, I had no way to check to see if the AP was still providing the power levels listed above. 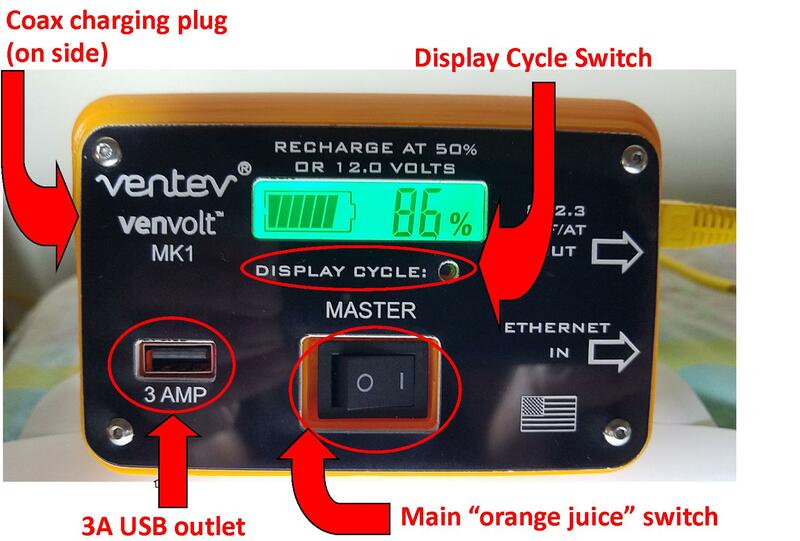 Just a note: when the VenVolt hits 12 V, get out the charging power supply to recharge it! But if the VenVolt can only power the 3800 for six hours, how do you complete a full eight-hour day of survey work? So, I also did a “how much recharge can you get on the battery over a lunch break?” test of the VenVolt. I let a VenVolt go completely dead and then put it on charge and set my timer for an hour. It came back to 100% — fully charged! Wow! 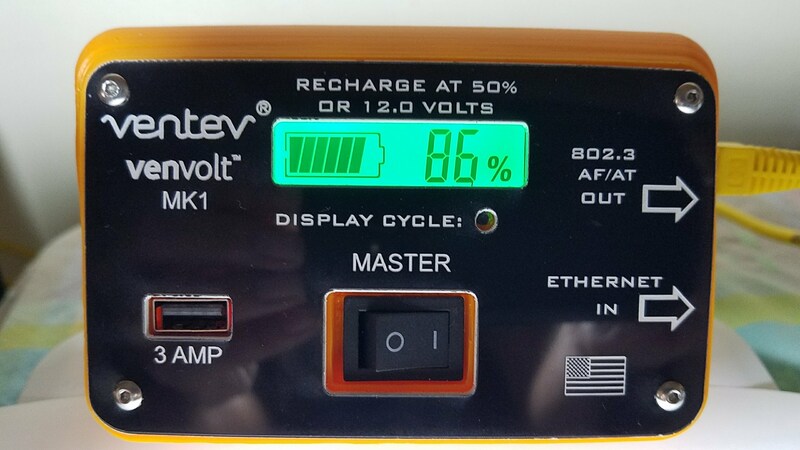 I’m not sure if this was because this VenVolt was new out of the box, but if you can recharge over a lunch/dinner break for an hour, it will give you some confidence that your VenVolt will not die out in the afternoon. So, what do I think about the VenVolt? What I like: I really like the VenVolt a lot! It’s light to fit in my backpack or carry-on luggage. 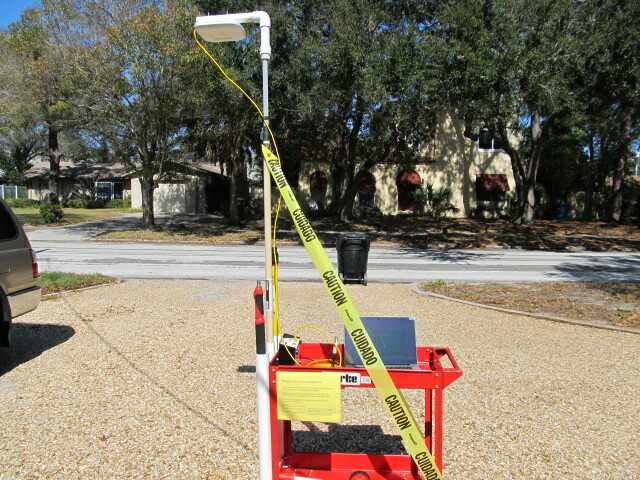 It easily charges overnight for the next days’ surveys. It is one of the few battery packs out there that will handle the higher powered APs like the Cisco 3800. Unlike some battery packs, it gives the voltage/percentage on the display screen. If you need to take a lunch break, it can do an hour recharge. 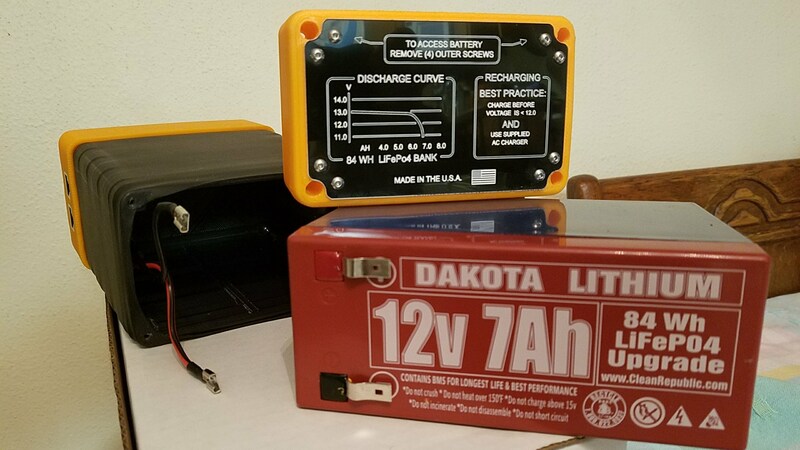 And when you need to replace the LiFePO4 battery, that’s pretty easy and fairly inexpensive to do that as well. 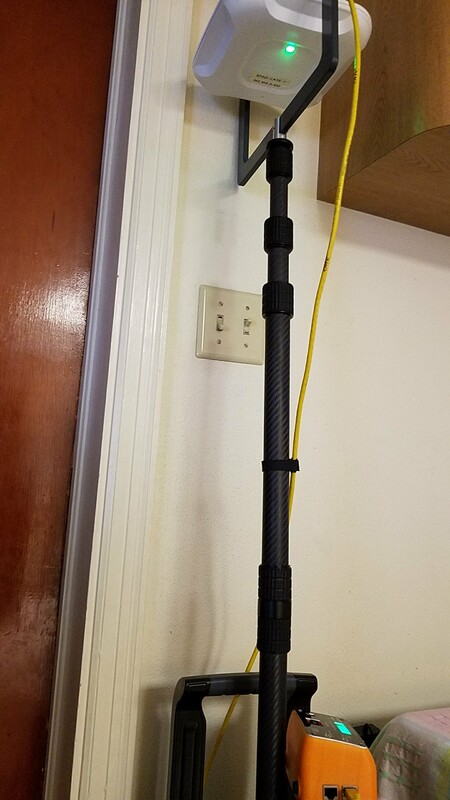 What I would change/add: If the VenVolt had a couple of nice HD Velcro straps, it could attach well to my painter’s pole for APoaS surveys. And it would be nice if the VenVolt powered the 3802i for a full day of surveying. But I know there is a limit to battery size/weight compared to power time. I think most WLAN professionals that fly a lot would agree with me that a few pounds less in our checked baggage is a nice compromise. Also, when the voltage goes below 12 V, it would be a welcome feature if the VenVolt “beeped” at you to advise (we are busy freezing APs and do not have time always to check the voltage on the display). What I don’t know: How well does the VenVolt power the new Cisco 4800 AP that was just released? I may need to do an update when I get a 4800 to test out. 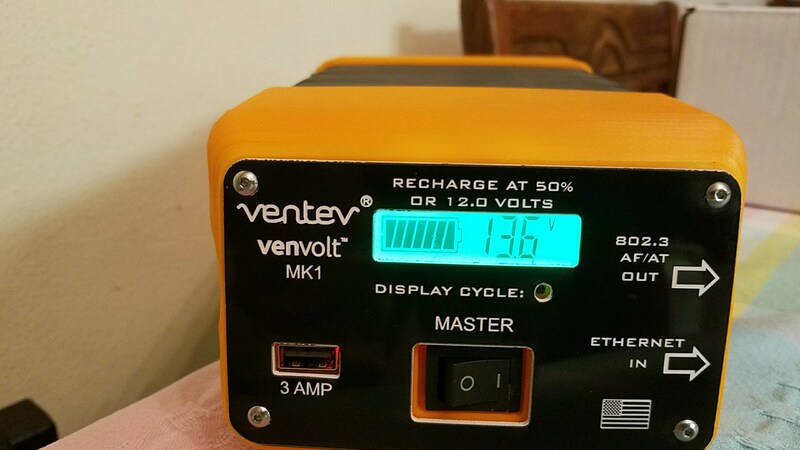 Ventev, good job on the design of the VenVolt! 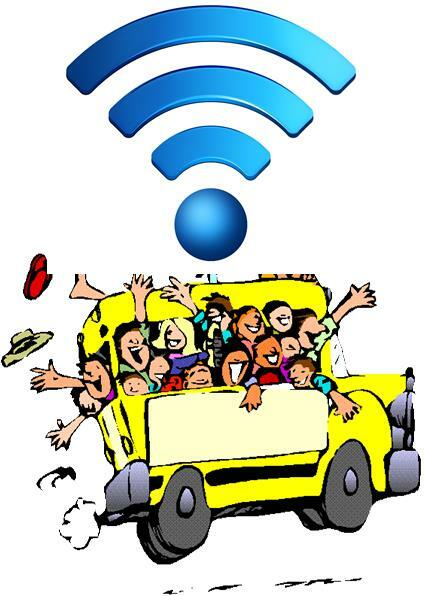 It is a tool that will help all WLAN professionals get their work done faster with greater efficiency! (Take a look at the well-written user guides and spec sheets below). The MSRP of the Ventev VenVolt is $499.